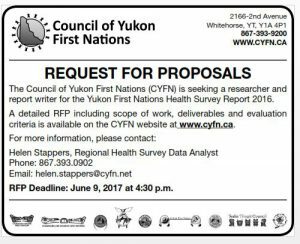 a working group consisting of members of Yukon First Nations to assist with the writing of a survey report based on information from health surveys collected in 2016. The contractor will help place the survey data chosen for dissemination in a relevant context and highlight the issues that currently exist in the areas of health and well-being. The contractor hired for this project will help with the selection and writing of the context pieces related to the statistics chosen to be presented in the Yukon RHS report. 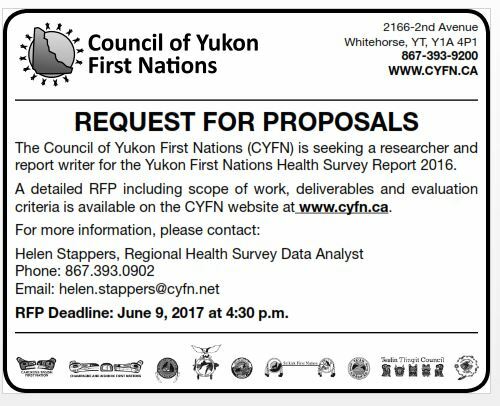 RFP Deadline: June 9, 2017, at 4:30 p.m.